I’m in the middle of a few projects now, but also finally wrapping up the first limited edition print. It should be up on the site in about a week, but I couldn’t resist posting a few initial drafts. I wanted to choose some imagery with a lot of lines, and of course I love tree graphics. 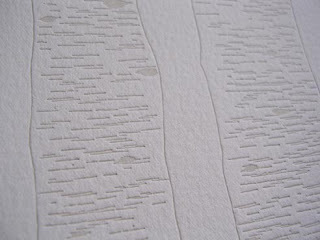 So a wintery birch surface seemed like a perfect fit. Can’t wait to complete the final version. Blue seems to be the color of choice this year. 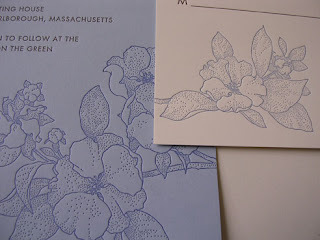 Here is a wedding invitation set I printed this weekend, featuring blue ink on blue and cream paper. The bride-to-be submitted the artwork, and made all the color/paper decisions while she was here visiting the studio. Quite a good job if you ask me. 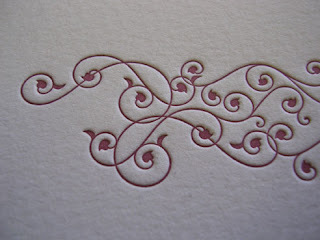 This warm and vibrant red ink is a soothing sight on such freezing day. It is part of a wedding invitation I printed last weekend. I love the color and style choices. I printed a large job this weekend using various colors of wastenot paper. 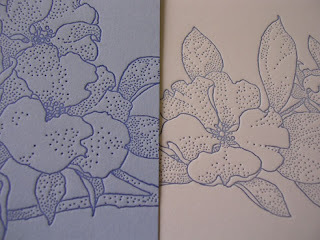 In the end, I found myself with about two thousand 3.5″x8.5″ scraps. I stood looking at the heap for a while, wondering if I should possibly hold onto such a huge pile paper that I may or may not ever use. 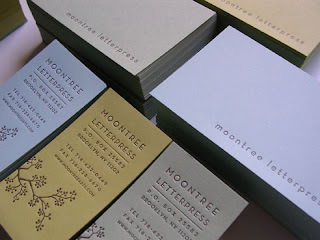 Back in my early printing days, I kept almost every piece of scrap paper larger than business card size. Before long my shelves were totally cluttered and merely glancing over there made me feel disorganized. I have a lot less overage these days, mostly because I can more accurately determine how much paper I’ll need before I start. But ocassionally I have lots of extra, and it always pains me to throw it into the recycling bin. However, this weekend’s scraps are tomorrow’s treasures. 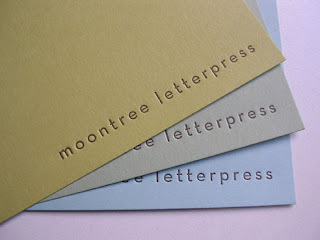 I printed a new stack of business and notecards, and the new colors are making me really happy. 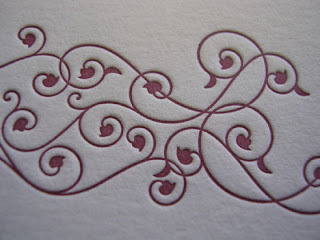 This post is a little long, but oddly enough I could talk for hours about paper and when to throw it away. 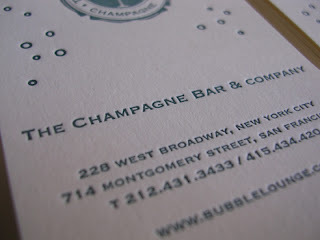 Working on various projects throughout the week, including business card reprints for The Bubble Lounge. This is such a gorgeous place, and I’ve really enjoyed doing their printing for the past two years. They have locations in New York City and San Francisco, so keep them in mind if you ever need to do some very classy celebrating. 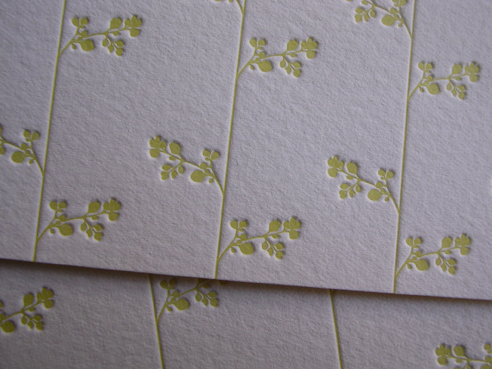 Lately I’ve become obsessed with letterpressing pattern designs to resemble wallpaper. I’ve had so much fun taking some of my older images and converting them into patterns. It really breathes new life into some of my older artwork. 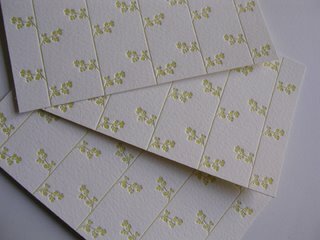 I’m going to be rolling out some new wedding invitations soon (including this pattern), so I’ll be sure to post them when they’re done.